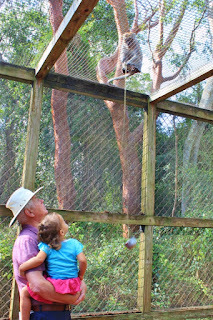 Looking to make a day special for our two and a half year old granddaughter, we settled on a trip to Monkey Jungle. Every time we make the drive from the Key Largo condo to where they live, we pass the exit sign for it. Now we can say our curiosity has been satisfied. The day began around 9:30 AM just after the park opened. 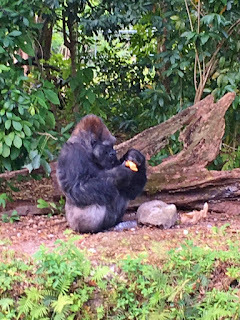 As a matter of fact, we may have been the first visitors in because after we purchased our tickets ($27.95/seniors and our granddaughter was free since she was under 3) I heard the lady use her walkie talkie to say there were visitors in the park. There are several interactions between trainers and animals throughout the day and our first was at the monkey swimming pond. 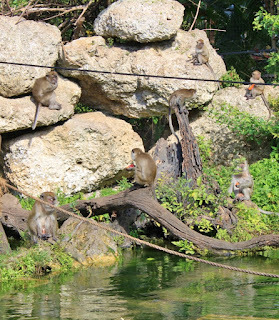 The monkeys, Java Macaques, will wade into the pond as the attendant throws pieces of fruit, vegetables and nuts to them. Once the feeding was started, they seemed to come from everywhere. The attendant talked about the monkeys and their history, native country, etc. 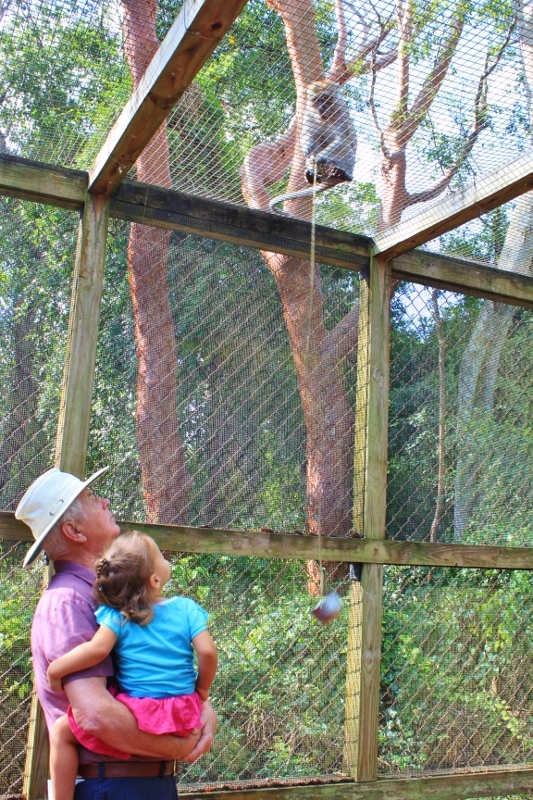 but we were a bit more attentive to our youngster who was thrilled at seeing her first monkeys of the day. Toward the end of the feeding, the attendant took out two hard boiled eggs and tossed them into the water a little deeper than the other food. Two of the monkeys actually dove to the bottom of the pond to retrieve their treat. It makes me question why they don't just swim to the open area where people view them and escape. But then I always wondered about that at Monkey Island at the CLEMet Zoo when I was a kid. We next started down a screened-in walkway that extended into the jungle area of the monkeys. They climbed up over our heads and ran across the top of the screen and sat and watched us. When we saw the little dishes on the end of a chain hanging down at intervals we understood why. We took out the box of raisins we'd bought at the entry and put some in a dish. It immediately was pulled up to the top of the screen and a monkey hand reached through a small hole and snatched the raisins. The metal dish fell quickly down again, ready to be filled. Our granddaughter delighted in filling the little dishes with some raisins as we continued our walk to the orangutan. It was a little too early for her feeding and she wasn't moving much so we wandered down another path that took us to several aviaries with birds and an iguana and turtle. 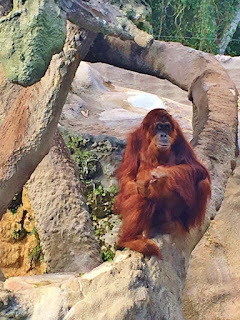 At a couple minutes before the set time for the orangutan to get breakfast (by now it seemed more like brunch) we returned and took a seat. The trainer came and began by introducing us to Mei (May) and telling us more about her. There were several trained behaviors Mei did all of which were rewarded with more fruit treats. Mei was a pretty good catch but if it fell, she didn't go down to pick it up. She did however retrieve the ones she missed as she made her way across her habitat at the trainer's direction. The interactions were all to show you her body movements, size, etc. to understand the animal better. I was impressed. The same could be said of the gorilla experience. 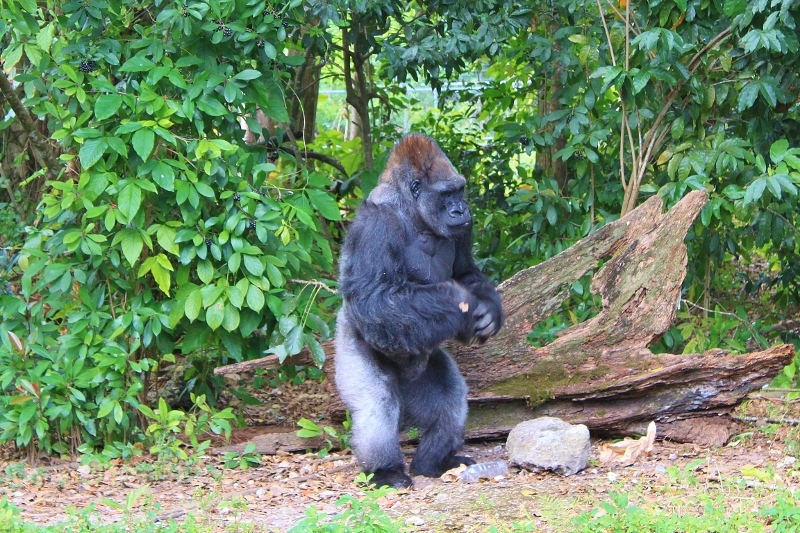 The gorilla was a male and was across a great divide from us. He had to have his food put in paper sacks to be tossed to him because he wouldn't eat it if the food got dirty. Smart guy. 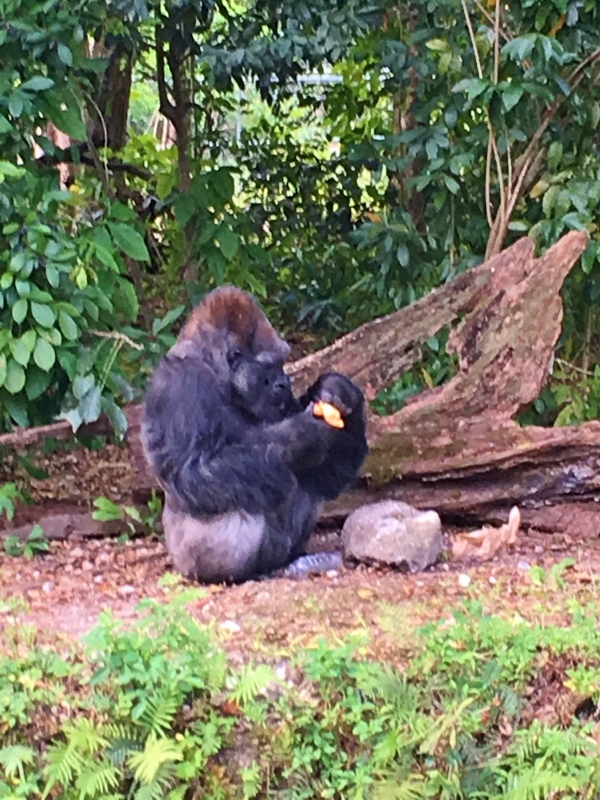 Again, the trainer explained his movements and what he would be like in his natural habitat and did it by making him move around to get some of his food. I'm sure though he wouldn't be drinking his juice from a plastic bottle and then putting it in the recycling bin out in the jungle. The other area to experience was not quite as much fun. It was the Amazon jungle area where there were spider monkeys and Capuchin (remember Night At The Museum?). 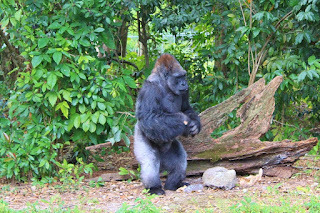 The attendants went into the rain forest area behind the screening and we watched as they fed the monkeys. It was difficult to take any pictures because of the screen but it was protection for us as well as the monkeys. There are quite a few acres for all the smaller monkeys to roam. Joseph DuMond, an animal behviorist, arrived in South Florida in 1933 with six Java monkeys. Today there are 140 all descended from the original six. And of course the jungle has expanded to include the others. It was an interesting morning but by noon our young granddaughter was thinking McDonald's. Of course we accommodated her.